At first glance, you wouldn’t think that this simple, truthful newspaper cartoon would be controversial enough for a long-time cartoonist to lose his career, but we live in a brave new world, where corporate censorship supersedes even government censorship; and when a giant like Monsanto is insulted, heads will roll. Friday received an email from his editor at Farm New [sic] cutting off their relationship a day after the cartoon was published. Again, I fall hard in the best interest of large corporations. 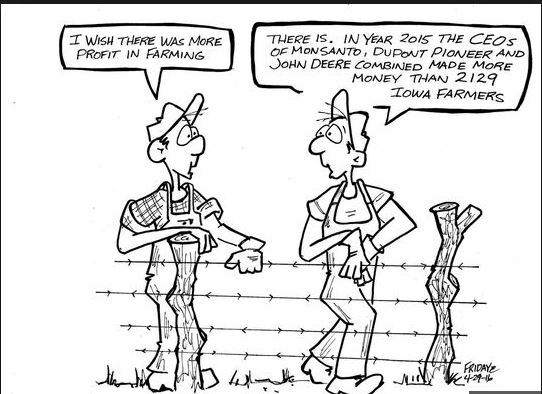 I am no longer the Editorial Cartoonist for Farm News due to the attached cartoon which was published yesterday. Apparently a large company affiliated with one of the corporations mentioned in the cartoon was insulted and cancelled their advertisement with the paper, thus, resulting in the reprimand of my editor and cancellation of its Friday cartoons after 21 years of service and over 1,090 published cartoons to over 24,000 households per week in 33 counties of Iowa. 22 Comments on "Long-Time Cartoonist Fired For Daring To Speak The Truth About Monsanto Profits"
I get the feeling that these companies don’t advertise with the media to actually sell their products to the consumers reading/watching, but instead advertise in order to be able to control the information. A loophole that they use to control the “news”. I see it all the time on CNN with Pharma commercials. Is this a fairly recent realization of yours? Next step, throw your television set in the garbage. The fog does eventually clear some. Monsatino should be nailed closed, shuttered and banned from ever rising. He is good enough to get a job elsewhere. His former newspaper is atrocious. On top of this, the GM industry is fleecing the tax payer…. aww did he hurt the feelings of greedy ceo’s? poor butthurt babies! 3 MILLION farmers should all cancel their subscription to Farm News, because farm news stifling THE TRUTH for profits! CANCEL YOUR SUBSCRIPTION TO FARM NEWS AND LET THEM GO BANKRUPT! That is the first thing I thought of. Hey nochip, sent you a reply that the auto scan blocked and put in “pending” limbo. One of the big reasons I stay away from AP is their nanny state language cops. Yeah, AP is CO, (highly controlled). I’m not sure why some words are censored, but I do know that they do not allow words that start with “J” and end with “ews” when in actuality, those that are in control claim themselves to be “J” “ews” but they are not. They are satanists. AP bleeds out rabbits for people that like to find out what is going on behind the scenes. Once in awhile I get the notion to do a little doomster diving, so I come here to satisfy my craving to see when the world is going to end. Even AP has an agenda. Check out my profile and you will see my innocent comment to you. Must be SJW’s at the helm at AP?? Your deleted comment is not publicly visible on your profile. 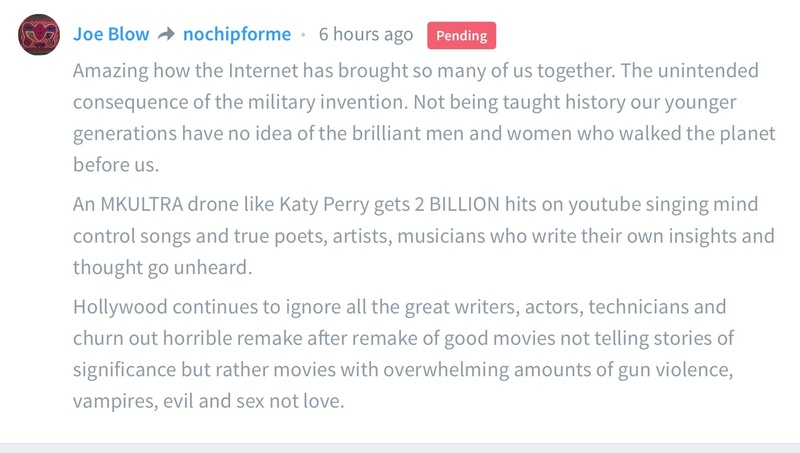 The only reason I can see that it would have been sent to moderation is the “S” word. Regarding what you said, I do think it was an intended consequence to bring people “together” in a digital venue, where people are truly isolated from their real world around them. When they shut the power down (The will shut the power down) then the only way for people to get reconnected will be to first verify their ID, via the embedded microchip in their state issued ID, banking cards, or the implanted microchip. The end goal is to positively identify every single person and to mark their slaves via ID. If you go to my profile and look at my channel, you can scroll down to “The Mark, The Name, Or The Number of The Beast” and I have linked some of my research in that article. @Grace by Faith on yt is pretty knowledgeable regarding the legalities of the identification system that has been set up. We really are not very far from a power down. A lot of this of course is from the collusive and collaborative efforts of various nefarious groups all adding their brand of evil to the soup. The Agenda 21 and 2030 program is in the lead to get people out of the rural areas and stack em and pack em in controlled cities. I’ll check out Grace. I’ve been doing this for over 40 years so there is not much new to my data base. Thanks. You are correct. The prophecies actually show that this global dominion will have the people “stacked and packed” in controlled society. It really does bother me that their goats have so much deceptive power over people. They just cannot see through the smoke. No, always use “Chews” or J3ws now. Sounds like somebody has an inferiority complex. And rightfully so. Excuse me (raises hand), “Why did the paper publish the cartoon, and THEN fire Mr. Friday?” It seems as if Farm News was happy to let the mice play, as long as the cat didn’t notice. On the other hand, Mr. Friday should have considered the possible consequences of his actions. Most of don’t go around biting the hand that feeds us. It also seems as if there is more to this little story than we are being told.